In first, incendiary balloon lands in central Jerusalem. Police units in Jerusalem responded to s suspicious balloon found in a building site in the central area of Emek Refaim. Police bomb disposal experts arriving at the scene are working to prevent danger to the public. 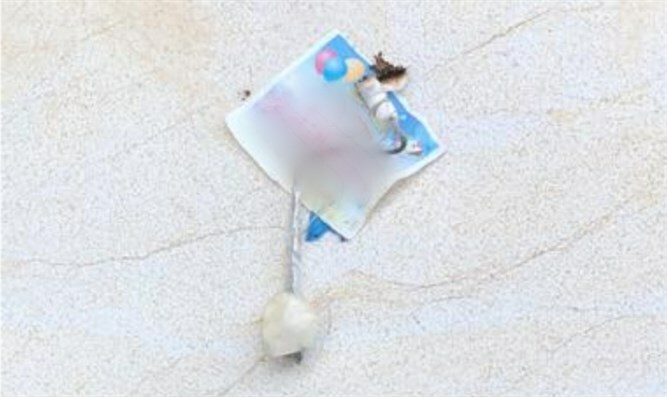 In May, Gaza terrorists began sending incendiary kites and balloons into Israel, endangering lives, wasting precious water resources, burning tens of thousands of dunams of land, and causing millions of shekels in damage. Later, incendiary kites and balloons began landing in Gush Etzion, near Jerusalem. Due to the distance and local topography, it is expected that incendiary materials landing in Gush Etzion were sent not by Gazan terrorists, but by Palestinian Authority (PA) terrorists. This is the first time an incendiary balloon has landed in Jerusalem. However, an incendiary kite landed in a Jerusalem yard in July.